The statistic presents the results of a survey conducted in January and February 2018 to find out about the situation of women and gender (in)equality across 27 countries. 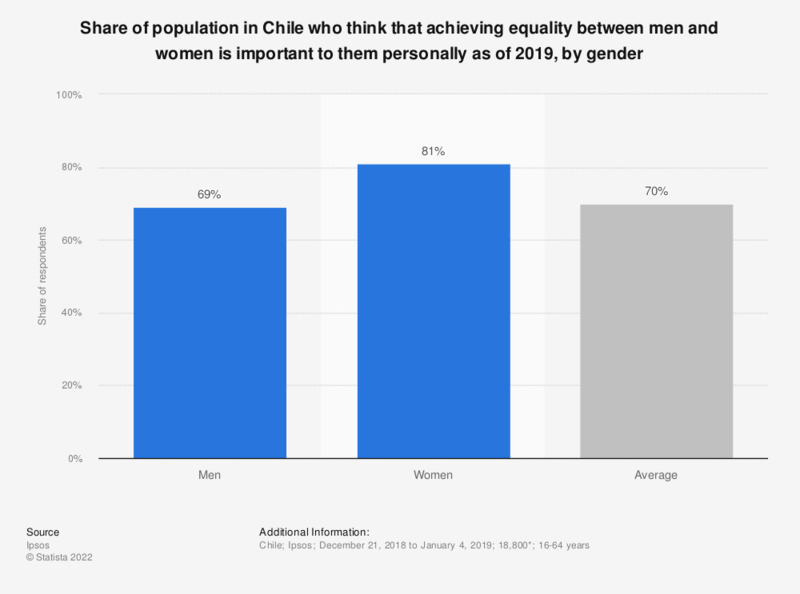 In Chile, 73 percent of male respondents strongly or somewhat agreed that achieving equality is important to them personally. * Respondents aged 16 to 64 across Argentina, Australia, Belgium, Brazil, Canada, Chile, China, France, Great Britain, Germany, Hungary, India, Italy, Japan, Malaysia, Mexico, Peru, Poland, Russia, Saudi Arabia, Serbia, South Africa, South Korea, Spain, Sweden, Turkey and the United States. The source worded the question as follows : "Below is a list of statements. For each, please indicate whether you strongly disagree, somewhat disagree, somewhat agree, or strongly agree: Achieving equality between men and women is important to me personally". Figures only include the share of respondents who answered "Strongly/somewhat agree".